EVEN THE STARS: TRACK OF THE DAY / INTERVIEW - Rory Wynne - D'ya Wanna Do It Again? TRACK OF THE DAY / INTERVIEW - Rory Wynne - D'ya Wanna Do It Again? Rory Wynne releases D'ya Wanna Do It Again? today, a new single via Very Clever Records, just a few short months after the release of his self-titled debut album. As he prepares for a show at Neighbourhood Festival in a couple of weeks, we caught up with Rory for a frank and honest chat about the music business, playing live and to talk about the single. It's only been a few months since you introduced your debut album into the world. Why have you decided to put out a brand new song instead of going down the more obvious route of two or three singles off the album? Well, those songs are out there now if people want to hear them and although there were a few tunes on it I would have liked to re-do afterwards that I perhaps didn't record and produce to their full potential. I don't like to dwell on the past especially if it's not been successful as I'd like. If it was a number one record then I'd probably release 2 or 3 singles. But I like to move on to the next thing and I wrote a bunch of songs just after the LP came out, also my production came along a lot since the LP... so to rewind the clocks back six months and put another track from the album out as a single didn't appeal to me at this moment. 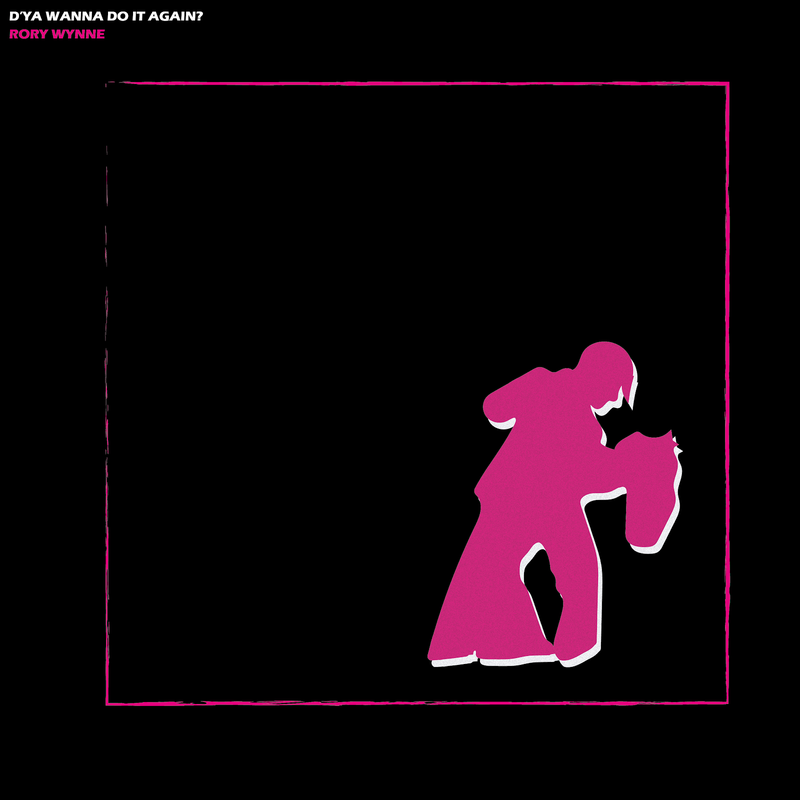 Also with Neighbourhood Festival coming up I wanted something new to promote and Very Clever Records were on board to put a single out - so I headed to my studio and recorded 'D'ya Wanna Do It Again?' in one day. I'm very excited to see the reaction to it - I hope people love it as much as I do! Could you tell us a little about D'ya Wanna Do It Again? Is it from the album sessions or was it written once the record was complete? It was probably the most recent one I wrote after the album was released, I had two or three left over from the album sessions then I wrote 4 or 5 just after it came out and D'ya Wanna Do It Again? was the last of them! I had the chords and drum beat recorded for weeks and then finally I sat down and all the melodies came to me and I put words to that, so I'm not entirely sure what the song is about... I just came up with the hook 'D'ya Wanna Do It Again?' and took it from there. The single's artwork is pretty striking, where did the idea for that come from? The song made me want to dance so originally I wanted a disco ball on the artwork because it felt like a disco ball worthy song. But as I was working on it, I figured that leaving the two dancers on their own seemed more striking and timeless. Also dance can be a euphemism for pretty much anything which was perfect because I didn't want to define what the song is about. Have you written more new material since the album and can we expect a quick fire release like this one or will you be taking your time? I have a lot of, what I think are, singles ready to go so hopefully my releases will start being more frequent after averaging one a year for the past 5 years! I like putting new stuff out so I can move on and develop on it, even if it's a mistake - a life of learning from mistakes is better than making none but doing nothing. I really like what Pale Waves have done - obviously they had the big name of The 1975 behind the first two singles to give them a boost of momentum they could capitalise on and then put out, what seemed like as a fan, a continuous stream of releases. So I want to try and replicate that now because I have a lot of material and it'd be good to get it out so I can get better rather than sitting on unreleased songs for a year at a time. I'm always very excited to release new music! Has the experience of releasing an album changed In any way how you see yourself in the music business? Not really - it was similar to my EP release last year except with a lot less press, radio and shows to promote it... I think I'll definitely wait until I have a strong fan-base before I put out another album. I guess that's one thing I learnt because the Spotify stats show the last few tunes weren't even worth putting on there but I don't dwell on how it was received or how many plays it got. Obviously I care deeply because I want to be a huge star but looking at numbers isn't going to make that happen, writing and releasing songs and playing shows and building up a following will hopefully make that happen. Only so much development can be done by sitting and writing and recording, I feel like now I need to get out and play as much as possible to as many people as possible so I can develop as a performer. I've only had 2 public shows this year so it's hard to keep the excitement, momentum and magic going - especially as a smaller act where you don't have loads of gear and crew so your show very much depends upon being as tight as possible. But regarding how I see myself in the music business it was definitely a reality check that even though I'd had a load of support from Blossoms and stuff like that doing the tour the year before - the album didn't reach nearly as many people....now I don't know if that was because of the quality of the album or because of the gap between the EP and the LP or the Tour and the LP but it was definitely a learning experience that I needed to do more, on a more consistent basis. Momentum is key - and I haven't really had any so far and I think although I'd known it for a while, the album was a big learning curve in that regard. But I'm always excited to develop and work on what isn't working! You're playing Neighbourhood Festival again in a couple of weeks. Are there plans for any other dates after that? There's nothing booked at the moment, I really hope there will be a lot more shows soon. My last show was in May, which was a private event, and it's hard to stay tight with my backing band and keep any momentum going with such huge gaps in between. And as I've said many times, being on stage is what I live for, so it's very frustrating watching people you know, people you envy or people you feel you're better than - playing every week or day and you're just sat around planning a setlist for a show six months away. However on the other hand I understand a lot of those people play the same cycle of venues to the same group of people so I don't know if I'd be satisfied doing that either. I love playing for people and seeing their reaction, seeing what works, seeing what doesn't, seeing them feel a moment or lyric the same way you did when you wrote it. I love football and being a performer that doesn't play many shows is a lot like being sat on the bench all season - except there's not really an option to go on loan hahah. But I'm still young, I'm always working on stuff, my time will come. I'm always very excited to play a show and I can't wait for Neighbourhood Festival! D'ya Wanna Do It Again is out now. Rory plays Neighbourhood Festival in Manchester on Saturday October 6th.